Is the PCI Express SSD in the new MacBook Air as speedy as it seems? 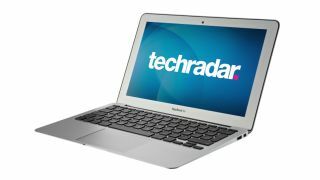 Apple has beaten most PC laptop makers again - with the new PCI Express SSD tech in the updated MacBook Air. The headline specs make for impressive reading. We're talking roughly 750MB/s for both reads and writes. That hammers the 550MB/s or so that current SATA-based solid state drive top out at. But before you get too excited, that's just part of the story. Specifically, that's just the sequential part. When it comes to how your PC actually feels to use, to your subjective experience of performance, random drive performance is at least as important as sequential throughput. It might even be more so. Indeed, random access is actually the metric by which SSDs really separate themselves from conventional hard drives with magnetic platters. While an SSD might be two or three times quicker than a conventional drive for sequential transfers, it might be be 20, even 50 times faster for random access performance. And that's why SSDs subjectively feel massively more responsive than magnetic drives. And it's why getting carried away with the peak sequential throughput performance of SSDs is a distraction. But how do you judge random performance? That's tricky, but one handy yardstick is the quoted IOPS or I/O operations per second claim. Currently, the fastest drives claim max IOPS performance of about 100,000. That doesn't get you anywhere the 550MB/s-odd limitation of the SATA 6Gbps. So upgrading to some kind of PCI Express-based drive isn't going to help unless that drive also improved IOPS performance. Which it currently won't. But in the near future, it might. Here's an interesting example to whet your appetite. ADATA has announced the SX2000 SSD. It weighs in at 1.6GB. And it delivers claimed read and write speeds of 1.8GB/s. Yowsers. But like I said, sequential numbers can be seductive. What about the IOPS? ADATA is claiming it's also good for 200,000IOPS. Now that's an impressive all-round package. It's all enabled by a new SandForce controller codenamed Griffin and the new SSF-8639 interface which is essentially a four-lane PCI Express solution. But it won't be cheap. Pricing will be somewhere north of £1,500. Painful, I know, but it hints at what's coming down the line for more mainstream and affordable SSDs. As it happens, I've got a hunch the Samsung SSD PCI Express SSD inside the MacBook Air is nothing special when it comes to IOPS. So I doubt it will feel any faster than a regular SATA SSD. It does give Apple some nice big numbers to wheel out at the launch event. But now you know why it might not be as impressive in practice as it seems on the keynote stage.